During my trip to Guatemala earlier this month, I had the opportunity to visit the Tabitha Ministry in Guatemala City. I have known about Tabitha for years since Churchnet helps support it, but I enjoyed finally getting to see it myself. Ethics Daily ran an article today I wrote about Tabitha, its ministries, and its neighborhood. 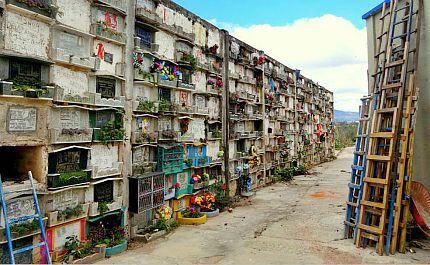 The piece is titled "Guatemalan Ministry Brings Life and Hope," and a photo I took of the nearby city cemetery ran with the article. This is an amazing ministry, so I hope you will read the article. Shortly after I returned from Guatemala, news broke that the richest 1 percent of people in the world will soon own half of the world's wealth. And the richest 85 people have as much as the poorest 3.5 billion people. This is a serious problem that leads to the scenes I describe in today's article: people living in a cemetery or spending every day scavenging through a city dump. The grotesquely rich few are creating hells on earth for large populations of people. The prophets of old were not quiet in face of inequality and oppression. We must not be quiet about it either.